Sati Jaymati was a Sati because of her devotion to her husband. Sati Joymoti is herself an epochmaking episode in the history of Assam, and in the history of the world. She sacrificed her life not only for the sake of her husband, but also for establishment of a peaceful kingdom struggling against oppression, corruption, mal-administration, etc prevailing in the mid-17th century. The kind of persecution meted out to a woman in the person of Sati Joymoti has no parallel in the history of the world. This was worse than the punishment given to "Draupadi" of Mahabharat fame and to "Sita" of Ramayana epic. But Joymoti Konwari tolerated this persecution without complaint until the last drop of blood in her vein. Wife of Ahom prince Gadapani Joymati is known as Sati Joymati because she endured torture and died at the hands of royalists under Sulikphaa (Loraa Roja), which enabled her husband to rise in revolt and become the king himself. Her son Rudra Singha had Joysagar dug at the spot where she was tortured. The first Assamese movie Joymati which was made in 1935 by Jyoti Prasad Agarwala featured this story. Born to Lai Thepena Borgohain in an obscure village of Mechagarh Maduri about 9 km away from Sivasagar, Joymoti carved a niche in her social status for her virtues like truthfulness, valour, courage, tolerance, patriotism and self sacrifice for the next generations to follow. During the Ahom period, a noble could marry several girls as wives. History reveals that Lai Thepena Borgohain had 12 wives. Joymoti happened to be the issue of the first wife Chandradaru, daughter of Lechai Borgohain. Thus, Joymoti had 24 brothers, 11 stepmothers and 12 sisters. Joymoti Konwari was married to Godapani Konwar, (son of Gobar Roja) of Tungkhugia family by Chaklong marriage. Godapani was young and dynamic, robust, handsome and capable of taking appropriate decisions. He was fond of hunting. Though Godapani did not have any formal education, he proved himself worthy of a leader with political acumen and foresight. Sensing trouble from Loraa Roja (machination to kill or maim the young princes), Godapani on advice of his wife Joymoti, fled to the Naga hills (now Nagaland) and took shelter under love and care of a Naga damsel "Dalimi". When Loraa Roja's soldiers failed to trace out Godapani, his wife Joymoti Konwari was summoned to the king's palace and she was asked to divulge the hiding place of Godapani. On her refusal to do so, she was taken to "Jerenga Pathar" in Sivasagar district and was tied to a "Kotkora Plant" (a thorny plant bearing fruits) and inhuman physical torture was inflicted on her. When Langi Godapani came to know about her torture' he came to Jerenga Pathar incognito and implored her to speak the truth. But she was firm in her decision and would not budge an inch. She even implored Godapani with signs and signals to move away from that place, or else he would be caught and put to prison, in which case her plan of building an empire with sound socio-economic and political scenario with Gadapani as king would be reduced to nought. When Joymoti did not disclose the whereabouts of Godapani, the intensity of oppression increased and after 14 days of continuous physical torture, Joymoti breathed her last on 13 Choit of 1601 Saka or March 27, 1680 AD. Joymoti Konwari, though basically a householder, epitomises spontaneous sacrifice which will enthuse the womenfolk to follow her exemplary ideal. Joymoti's greatness lies in the manifestation of her selfless and sincere truthfulness, heroism, patriotism, and self respect . Joymoti's self sacrifice is not merely to save the life of her husband, but more importantly, to protect a patriotic hero who could restore peace and tranquility in society fighting against the tyranny of contemporary rulers. Joymoti's dream became a reality when Godapani ascended the throne in 1681 AD and assumed the name of king Godadhar Singha. But unfortunately, Joymoti did not live to see her dream come true. In 1696 AD, Joymoti's eldest son Rudra Singha became the king and in honour of the memory of his mother he dug the Joysagar tank in 1697 ad at the place (Jerenga Pathar) where Joymoti Konwari was tortured. He also built Joydol on the bank of Joysagar tank. 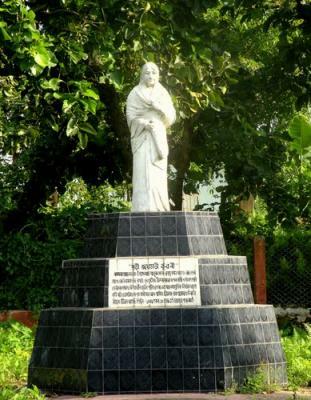 Sati Joymati Divas, Commemoration Day of Sati Joymati is held in Assam on March 27.